Arthur and Ray are stuck in Oz with no cash and no air tickets back to the UK, but never mind, with their British passports help is at hand at the British embassy. but alas no. They are stuck in Oz and have to rely on Ray working three jobs to pay their debts and get back to the UK, until Arthur has a stroke of luck. Some poor unsuspecting girl tries to sell Arthur some dodgy make up box in a pub and Arthur points to the errors of her selling ways and shows her how to do it. Which was brilliantly done. This results into a fortuitous friendship forming between the the Girl, Robyn and Ray, with the girls father being of somewhat dodgy character, passes some solar radios on to Arthur to sell, which he does, again another great scene in the episode. Arthur then ends up on the wrong side of the law trying to sell stolen electronic organisers to a cop, on top of being thought of as a drug dealing gangster, by the oz gangster, who was initially trying to steal the inheritance in the previous episode, who then suspects Arthur of being a grass! Both cops and Gangster want Arthur out of the country, just a typical Minder episode! I think the three episodes were very well done overall, just think an appearance by Terry, would have been the cherry on top. I was thinking exactly that when I watched these episodes last Friday, again really enjoyable and a fab end to the series. Ray sure does seem to have plenty of girlfriends. Wouldn't have these episodes cost far more than normal, would the viewing figures at the time have justified that cost. Is that where all the money went that could have been used in Series 10! 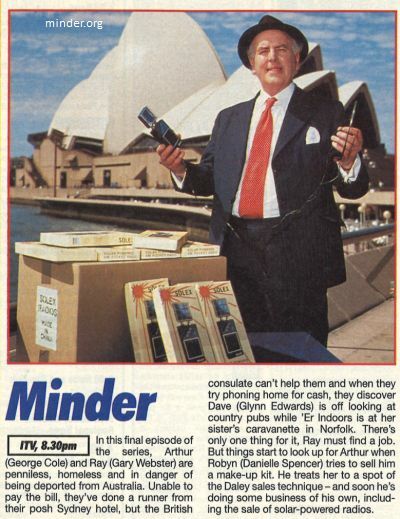 I actually thought series 10 was a cracker of a series, couple of dodgy episodes, but no more than other series of Minder over the years. There was a similar feature in the RADIO TIMES too, where they mentioned filming in Broken Hill, where Mad Max 2 was filmed. I think it may have been an interview with Gary Webster? In those days I just used to cut out the Doctor who listings on UK GOLD and put them in a scrap book, then throw the magazine out! GOD I was AN ANORAK! ...and we love you for it yoyo! I really like the Australian episodes and this one really takes Arthur back to basics as he has to raise the cash to get home. When i watched this episode with my aussie ex,she laughed but was a bit annoyed how Arthur carries on in the pub about being "a pioneer in the furthest corner of the empire" A "bl*ody typical straight off the plane old school pom she called him! It's becuase of this that I like this forum so much. The information gained on here is superb. Doctor who anoraks are a different breed! I knew a fan who bought his clothes in charity shops,so he had more money to spend on dr who stuff! He even had a blank tape in his VCR,ready to hit record if an actor who had been in doctor who was on screen, of if dr who was even mentioned! Another fan I knew even went on BBC radio Kent one Saturday night to appeal to listeners to return any lost episode of doctor who they had to the BBC! I liked this much more than the second part. I enjoyed Arthur's selling the goods to tourists and punters and felt it gave us a glimpse of what he was doing in his younger days. This three parter was a nice change but I can't help feeling it could have been better. Maybe instead of three regular length episodes the idea might have been better handled with the same first episode and then a movie length episode for the Australian part of the story. Maybe I just expected too much. I did like it just not as much as usual. It is nice to see Arthur doing what he does best, and selling tacky gear to mug punters! The scene where he sells the make up cases in the pub is classic minder through and through, as is the conversation between Arthur and Ray as the plane is taking off for the long flight home to blighty! 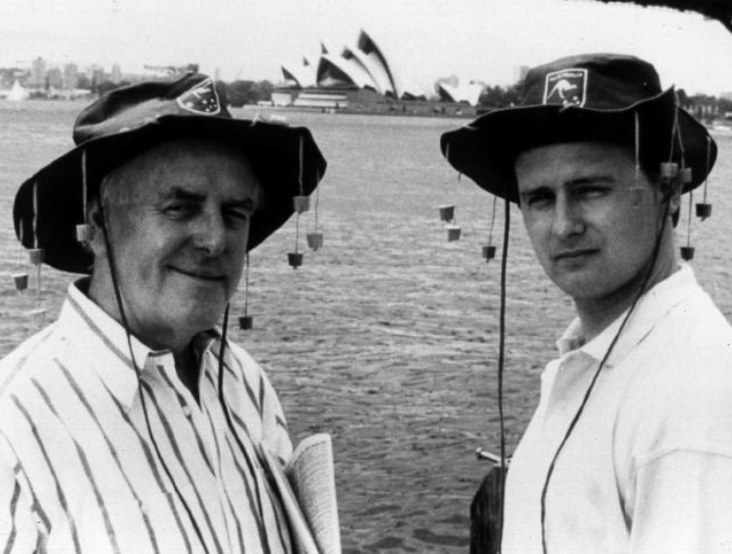 Another funny thing is, at the start of the episode, Arthur and Ray really do take a scenic roundabout tour of Sydney by foot! Very much like ANOTHER CASE OF VAN BLANK, where Dave and Ray head off to the south of the town, yet in the next scene they are in a cafe in the north of the town! Oh wow! I have never seen that one before. Me neither, looks like they are enjoying themselves.